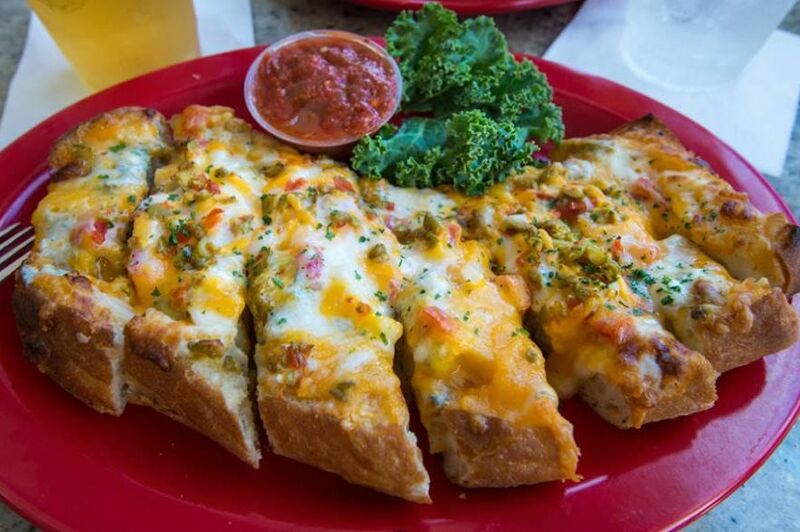 Meet the Sunshine State’s signature slice. If you order “Beach Bread” at any restaurant outside the , your request will probably be met with a puzzled look from your waiter. To outsiders, Beach Bread could be anything from the sandwich slices packed in your cooler to a fresh loaf baked by a local seaside bakery. But for Sunshine State natives, Beach Bread isn’t just any carbohydrate you eat near the ocean — it’s a Florida staple that’s developed a cult following. Even though Beach Bread is loosely defined as cheesy garlic bread, the thing that sets it apart from typical Italian fare is what’s added on top of it. Chetwin, after sampling numerous recipes around town, put his own spin on the staple by upgrading the bread to sourdough. Next, he combines together a trio of cheeses — blue, mozzarella, and cheddar— before finishing it off with onions, green olives, and diced tomatoes. “That way when it’s baked, it will be super colorful,” he explains. “Then it’s served with marinara for dipping.” However, some chefs, like Pete Walker, the owner of in Bonita Springs, cook up a simpler combination with mozzarella, provolone and fresh tomatoes. While other restaurants like have a version dubbed “Island Bread” that’s loaded with blue cheese, scallions, tomatoes and mozzarella.